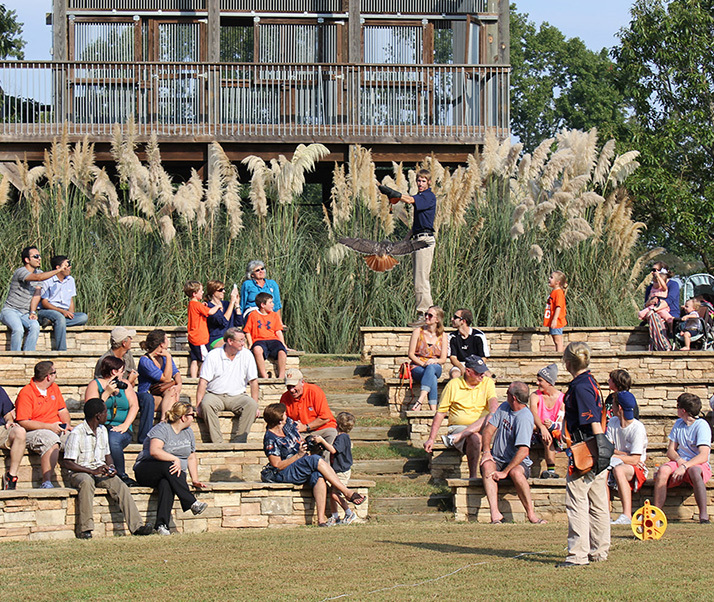 One of Auburn’s most popular fall programs — the Southeastern Raptor Center’s Football, Fans and Feathers — offers fans the opportunity to see a raptor show and flight demonstration up close and personal. Shows for 2018 will be held the Friday before Auburn home games on Sept. 7, 14, 21, 28; Oct. 12; Nov. 2, 16. Tickets are $5 per person and purchased upon entry or in advance by clicking here; there is no charge for children age three and under. The hour-long program begins at 4 p.m. at the center’s the 350-seat Edgar B. Carter Educational Amphitheater, located at 1350 Pratt-Carden Drive off Shug Jordan Parkway. Reservations are not required. Gates open at 3 p.m. For special rates for groups of 25 or more, call 334-844-6943. During the show, hawks, falcons, eagles and other birds of prey are free-flown from towers and around the amphitheater, enabling visitors to see these raptors flying close. This educational presentation is appropriate for all ages.